After another record-breaking year at the box office, 2016 is already looking like yet another banner year for China’s film industry. While Star Wars dominated January, this month is devoted to Chinese blockbusters angling to rule the all-important Spring Festival period. Released on Feb 8, here are the contenders for domestic supremacy. You can’t stop Journey to the West, you can only re-make it, and there are four highly anticipated adaptations on the way. This sequel to the 2014 hit is expected to crack the coveted RMB1 billion mark like its predecessor. While Donnie Yen is absent this time around, Aaron Kwok and Gong Li will provide this requisite star power. Plot details may be scarce, but audiences can expect a 3D effects-laden extravaganza capably handled by director Cheang Pou-soi (SPL II, The Monkey King). 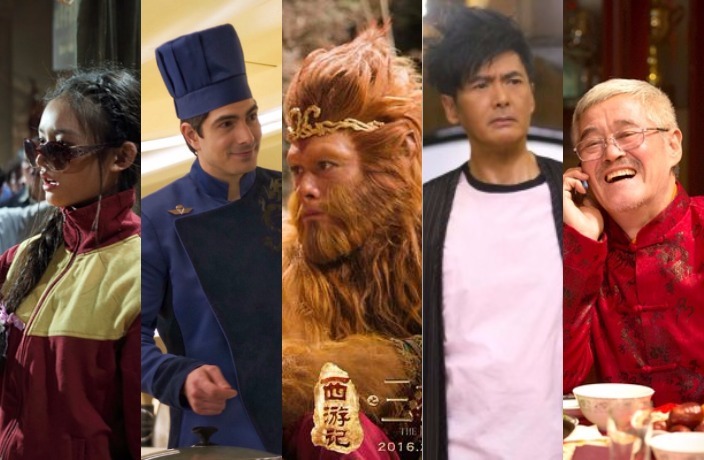 The biggest threat to The Monkey King 2’s dominance is the latest film from Hong Kong comedy legend Stephen Chow (Shaolin Soccer, Kung Fu Hustle). While the funny man is keeping himself to directorial duties, acclaimed actor Deng Chao will once again show off the comedic chops he displayed in 2014 hit The Breakup Guru. Set in modern times, Deng stars as a biology professor who is saved by a mermaid (Lin Yun), whom he inevitably falls in love with. Another Spring Festival, another edition of the comedic gambling saga. Once again, Chow Yun-fat returns as the impossibly charismatic Ko Chun, while megastars Jacky Cheung and Carina Lau make cameos. Even more exciting is the addition of Andy Lau, who reprises his iconic character of Michael “Dagger” Chan, aka the Knight of Gamblers. Lau’s appearance cements this franchise’s connection to the classic 1990s God of Gamblers series that spawned five films, while From Vegas to Macau has grossed over USD234 million over two films. Directed by Gao Qunshu, The New Year’s Eve of Old Lee features national comedian gem Zhao Benshan as the titular character andMy Own Swordsman star Yan Ni, who is known for her signature natural comedic style. The story unfolds with a festive New Year dinner, inviting viewers into some riotous family moments. Bad news for Craig David fans.